Department of Kaumarabhritya, Sri Dharmasthala Manjunatheshwara College of Ayurveda and Hospital, Hassan - 573201, Karnataka, India. ABSTRACT: Background: Dashamoola is a group of ten drugs i.e. Bilva (Aegle marmelos (L.) Corrêa), Patala (Stereospermum suaveolens (Roxb.) DC. ), Agnimantha (Clerodendrum phlomidis L.f.), Shyonaka (Oroxylum indicum (L.) Benth. ex Kurz), Gambhari (Gmelina arborea Roxb. ), Bruhati (Solanum nigrum L.), Gokshura (Tribulus terrestris L.), Kantakari (Solanum xanthocarpum Schrad. & H. Wendl. ), Prishniparni (Uraria picta (Jacq.) DC. ), Shalaparni (Desmodium gangeticum (L.) DC.) part used are moola of all the drugs. Dashamoola kwatha choorna is made use for parisheka in the management of spastic cerebral palsy in children. Aim: To standardize Dashamoola kwatha choorna. Materials and Methods: Physico-chemical studies like Loss on drying, acid insoluble ash, total ash, water soluble ash, alcohol soluble extractive, water soluble extractive and HPTLC were carried out as per the WHO guidelines, Indian Pharmacopoeia and Ayurvedic Pharmacopoeia. Conclusion: Standar-dization tests done on Dashamoola kwatha choorna helped in authenticating and ensuring the quality of the same. INTRODUCTION: According to an estimate of World Health Organization (WHO), 85 to 90% of the world’s population depends on traditional herbal medicines 1. WHO encourages, recommends and promotes herbal remedies in natural health care especially in developing countries like India 2. WHO considers phytotherapy in its health program and has even evolved guidelines for the validation of plant based drugs 3, 4. Standardizing Ayurvedic formulations helps in the establishment of biological activity and quality assurance 5. Due to increased concerns regarding the safety and efficacy of herbal drugs, specific parameters have been recommended to standardize and scientifically validate the same 6. It is also the need of the hour to develop cost effective medicine. Dashamoola is a group of ten drugs i.e. Bilva (A. marmelos (L.) Corrêa), 7 Patala (Stereospermum suaveolens (Roxb.) DC.) 8, Agnimantha (C. phlomidis L.f.) 9, Shyonaka (Oroxylum indicum (Linn.) Benth. ex Kurz) 10, Gambhari (Gmelina arborea Roxb.) 11, Bruhati (Solanum nigrum L.) 12, Gokshura (Tribulus terrestris L.) 13, Kantakari (Solanum xanthocarpum Schrad. & H. Wendl.) 14, Prishniparni (Uraria picta (Jacq.) DC.) 15, Shalaparni (D. gangeticum (Linn.) DC.) 7 part used are moola of all the drugs. Dashamoola kwatha choorna is made use for Parisheka in the management of spastic cerebral palsy in children. The present study details the standardization of Dashamoola kwatha choorna carried out. MATERIALS AND METHODS: Physico‐ chemical studies like loss on drying, total ash, acid insoluble ash, water soluble ash, alcohol soluble extractive, water soluble extractive and HPTLC were carried out as per the WHO guidelines, Ayurvedic Pharmacopoeia and Indian Pharmacopoeia. Plant Material: The constituents of Dashamoola kwatha choorna were collected from the local market of Hassan district, Karnataka state, India in the month of February 2017. The collected drug was identified and authenticated at the teaching Pharmacy of Department of Dravyaguna (Ayurveda Pharmacology), SDM College of Ayurveda and Hospital, Hassan, Karnataka state, India. Methodology: The studies were done at SDM Centre for Research in Ayurveda and Allied Sciences, Kuthpady, Udupi, Karnataka state, India as per standard procedure. Loss on Drying at 105 ºC: 10 g of sample was placed in tared evaporating dish. It was dried at 105ºC for 5 h in hot air oven and weighed. The drying was continued until difference between two successive weights was not more than 0.01 after cooling in desiccator. Percentage of moisture was calculated with reference to weight of the sample. Total Ash: 2 g of sample was incinerated in a tared platinum crucible at temperature not exceeding 450ºC until carbon free ash is obtained. Percentage of ash was calculated with reference to weight of the sample. Acid Insoluble Ash: To the crucible containing total ash, add 25 ml of dilute HCl and boil. Collect the insoluble matter on ash less filter paper (Whatmann 41) and wash with hot water until the filtrate is neutral. Transfer the filter paper containing the insoluble matter to the original crucible, dry on a hot plate and ignite to constant weight. Allow the residue to cool in suitable desiccator for 30 min and weigh without delay. Calculate the content of acid insoluble ash with reference to the air dried drug. Water Soluble Ash: Boil the ash for 5 min with 25 ml of water; collect insoluble matter on an ashless filter paper, wash with hot water, and ignite for 15 min at a temperature not exceeding 450 ºC. Subtract the weight of the insoluble matter from the weight of the ash; the difference in weight represents the water soluble ash with reference to the air-dried sample. Alcohol Soluble Extractive: Weigh accurately 4 g of the sample in a glass stoppered flask. Add 100 ml of distilled alcohol (approximately 95%). Shake occasionally for 6 h. Allow to stand for 18 h. Filter rapidly taking care not to lose any solvent. Pipette out 25 ml of the filtrate in a pre-weighed 100 ml beaker. Evaporate to dryness on a water bath. Keep it in an air oven at 105 °C for 6 h, cool in desiccator for 30 min and weigh. Calculate the percentage of alcohol extractable matter of the sample. Repeat the experiment twice and take the average value. Water Soluble Extractive: Weigh accurately 4 g of the sample in a glass stoppered flask. Add 100 ml of distilled water, shake occasionally for 6 h. Allow to stand for 18 h. Filter rapidly taking care not to lose any solvent. Pipette out 25 ml of the filtrate in a pre-weighed 100 ml beaker. Evaporate to dryness on a water bath. Keep it in an air oven at 105 °C for 6 h. Cool in a desiccator and weigh. Repeat the experiment twice. Take the average value. HPTLC: 1g of Dashamoola kwatha choorna powder was extracted with 10 ml of alcohol, kept for cold percolation for 24 h followed by fliteration. 4, 8 and 12 µl of the above extract were applied on a pre-coated silica gel F254 on aluminium plates to a band width of 7 mm using Linomat 5 TLC applicator. The plate was developed in toluene: ethyl acetate: acetic acid: methanol (3.0: 3.0: 0.8: 0.2). 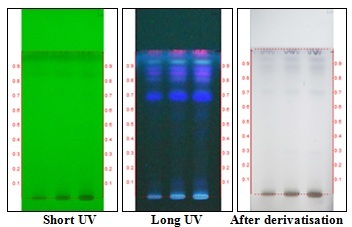 The developed plates were visualized under short UV, long UV and then derivatised with vanillin sulphuric acid and scanned under UV 254 nm, 366 nm and 620 nm. Rf, colour of the spots and densitometric scan were recorded. RESULTS AND DISCUSSION: The standar-dization parameters of Dashamoola kwatha choorna is detailed in Table 1. The Rf values of sample of Dashamoola kwatha Choorna is detailed in Table 2. The HPTLC photo documentation of ethanolic extract of Dashamoola kwatha choorna is shown in Fig. 1. The Densitometric scan of Dashamoola kwatha choorna is shown in Fig. 2. The physicochemical standards would serve as preliminary test for the standardization of the formulation. Tests such as loss on drying, acid insoluble ash, total ash, water soluble ash, alcohol soluble extractive, water soluble extractive and HPTLC, results of TLC photo documentation, the unique Rf values, densitometric scan and densitogram obtained at different wavelengths can be used as fingerprint to identify the herbal drug of Dashamoola kwatha choorna. CONCLUSION: Due to variation in the geographical source of drug, the identification of accurate biological source of drug is the main obstacle in Ayurvedic drug. Proper Ayurvedic drug standardization requires rational approach and in this regard fundamental aspects of Ayurvedic drug should be preserved. The results obtained through this study are reproducible and could be used for routine monitoring of raw material. Dashamoola kwatha choorna is endowed with various biological properties and hence efforts have been made here to provide scientific data on the same. ACKNOWLEDGEMENT: Authors are highly grateful to the constant support and guidance of Dr. Prasanna N. Rao, Principal, SDM College of Ayurveda, Hassan and Dr. Mallika KJ, Research co-ordinator, SDM College of Ayurveda, Hassan. The authors thank Dr. B. Ravishankar, Director, SDM Centre for Research in Ayurveda and Allied Sciences for providing the facilities and guidance. Arun K, Tapas BT, Kumar S, Kumar SKN and Raj AGR: Standardization of Haridradi Vati of Ayurvedic formulary of India (AFI). Int J Res Ayurveda Pharm 2015; 6(6): 688-691. Rasheed A, Sravya RB and Roja C: A review on standardisation of herbal formulation. Inter J of Phytotherapy 2012; 2(2): 74-88. Waddar S, Gopi KBJ, Rao PN, Raj AGR and Waddar S: Standardization of Mulaka (Raphenus sativus ) Kshara: A herbal alkaline preparation. Journal of Pharma-cognosy and Phytochemistry 2014; 3(1): 108-110. Nidhin PS, Yaligar MG, Arun Raj GR, Kumar SKN and Ravi M: Standardization of Harithaki (Terminalia chebula) powder and Trivrit (O. turpethum L.) powder: Two important drugs used for purgation in Ayurveda. Journal of Pharmacognosy and Phytochemistry 2015; 4(1): 203-209. Mallanavar V, Shailaja U, Kumar SKN, Bharati AKS and Raj AGR: Standardization of Karshyahara yoga: An Ayurvedic nutraceutical supplement. Int J Res Ayurveda Pharm 2016; 7(S-1): 94-97. Viswaroopan D, Raj AGR and Shailaja U: Standardization of Ashwagandha Ghrita: A herbal ghee based ayurvedic medicinal preparation. Int J Pharm Sci Res 2016; 7(2): 819-23. Raj AGR, Shailaja U, Rao PN and Ajayan S: Review on the concept of immunomodulation in Ayurveda with special emphasis on Prakara Yoga. Int J Pharm Sci Res 2014; 5(4): 1116-1123. Raj AGR, Shailaja U, Rao PN and Debnath P: Nutraceuticals and Functional foods. Houston-Texas, USA: Recent Progress in Medicinal Plants. Studium Press LLC; Nutraceuticals and Functional foods in Ayurvedic perspective, Edition 1st, Vol. 42, Chapter 10, 2016; 172-199. Jameel M, Ali A and Ali M: Extraction and isolation of new compounds from traditional herbal medicine; Clerodendrum phlomidis Future Journal of Pharmaceutical Sciences 2017; 3(2): 118-123. Sreejith GS, Ittoop J Ancheril, Kumar SKN, Anitha MG and Raj AGR: Chemical analysis of Dushivishari agada: An Ayurvedic herbo-mineral formulation to combat residual toxicity. Int. J. Res. Ayurveda Pharm 2016; 7(S-1): 80-83. Kulkarni YA, Panjabi R, Patel V, Tawade A and Gokhale A: Effect of Gmelina arborea Roxb in experimentally induced inflammation and nociception. J Ayurveda Integr Med 2013; 4(3): 152-157. Wang Y, Xiang L, Yi X and He X: Potential Anti-inflammatory steroidal saponins from the berries of Solanum nigrum (European Black Nightshade). J. Agric. Food Chem 2017; 65(21): 4262-4272. Raj AGR, Shailaja U and Rao PN: Preventive medicine in children: An ayurvedic approach highlighting native vaccinations. International Journal of Innovative Research and Development 2013; 2(6): 886-893. More SK, Lande AA, Jagdale PG, Adkar PP and Ambavade SKD: Evaluation of anti-inflammatory activity of Solanum xanthocarpum Schrad and Wendl (Kaṇṭakāri) extract in laboratory animals. Anc Sci Life 2013; 32(4): 222-226. Igboechi AC, Osazuwa EO and Igwe UE: Laboratory evaluation of the acaricidal properties of extracts from picta (Leguminosae). Journal of Ethnopharmacology 1989; 26(3): 293-298. Srilakshmi, Shailaja U and Raj GRA: Standardization of Dashamoola kwatha choorna: a herbal compound drug used for parisheka in spastic cerebral palsy. Int J Pharm Sci & Res 2018; 9(11): 4937-40. doi: 10.13040/IJPSR.0975-8232.9(11).4937-40. Authors Address: Department of Kaumarabhritya, Sri Dharmasthala Manjunatheshwara College of Ayurveda and Hospital, Hassan, Karnataka, India.